The month of June is when the arctic comes to life. Rivers and creeks are running again, grizzly bears are out of their slumber and songbirds have returned for the brief summer. Odds are that we won’t see another frost until the third week of August. As we enjoy nature’s short rebirth, we thank Our Heavenly Father for the miracle of life, and for your generous support for our radio mission. May He bless you abundantly for your kindness! IN HIGH PLACES: (left) In late April, plows began to open the gravel roads that surround Nome. Four miles east of town, they created tunnels through drifts, very substantial drifts, as public affairs director Amy Flaherty demonstrates. 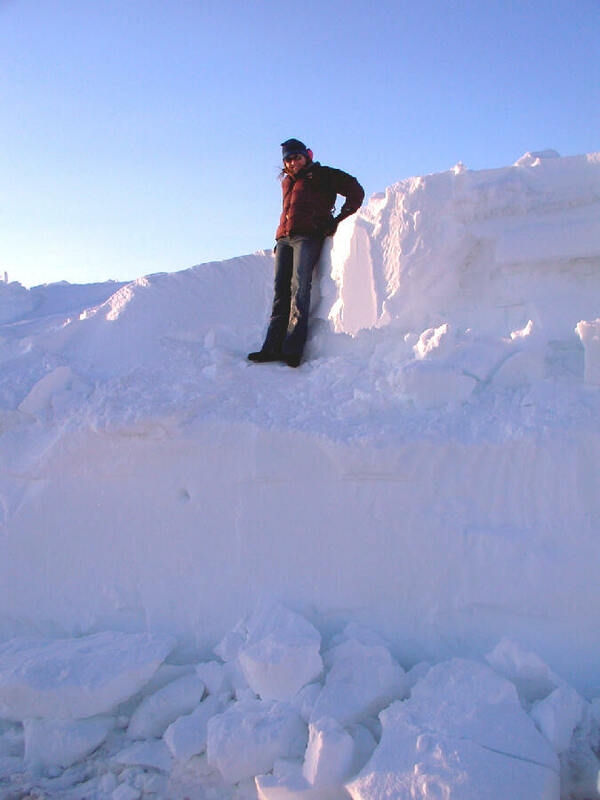 In the middle of May, some of these drifts were still as high as eighteen feet. BREAKING UP IS HARD TO DO: May and early June are the “breakup” season, as starting upriver, streams lose their ice, sometimes violently. It’s not unusual for jams of broken ice to form, damming a river or creek, sometimes causing catastrophic flooding. You can bet that for 100,000 square miles, folks were listening very carefully to KNOM’s daily river breakup forecast. NET RESULTS: Here on KNOM’s web site, you’ll find every Nome Static from May 1997, hundreds of photos, historical information, inspirational spots and much more. Please join us! KNOM is the oldest Catholic radio station in the United States. Thank you for your help! INSPIRATIONAL SPOT: Do not fear what may happen tomorrow. The same loving Father who cares for you today will care for you tomorrow, and every day. Either God will shield you from suffering, or God will give you unfailing strength to bear it. INSPIRATIONAL SPOT: Hope is a good loser because it has divine assurance of a final victory. ASK VOLUNTEER MUSIC DIRECTOR LIZ RECCHIA (left) WHERE SHE’S FROM. “It’s a difficult question for me,” she says. 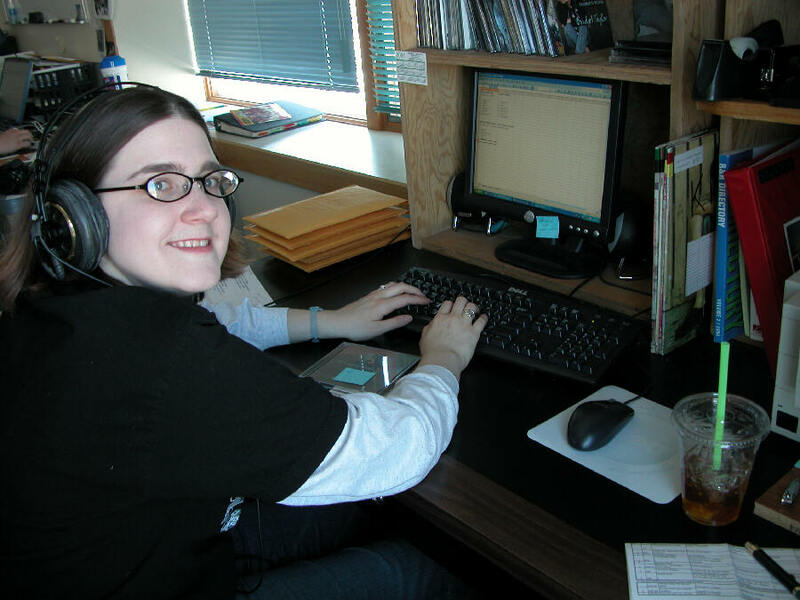 In two months, Liz completes her second year as a KNOM volunteer, and will begin working for Nome’s Northwest Campus of the University of Alaska. Yay, Liz! FOR THE BIRDS: With migratory birds arriving from Asia throughout May, a focus of KNOM’s public affairs programming has been the possibility of avian influenza becoming pandemic. If that happens, western Alaska will likely be the first region of North America to be affected. Birds and their eggs are an important source of protein for many village Alaskans. You can imagine how deeply worried people are. Our shows discussed how to properly harvest, handle, prepare and cook birds, and what preparations families and communities should be making. In mid-May, we hosted a top emergency official from the State of Alaska and a Fish and Game expert for a 75-minute marathon broadcast. Meanwhile, KNOM, working with Nome’s Local Emergency Planning Committee, is developing an emergency plan of our own. What if Nome's power plant operators become ill? The town could lose electricity, and officials are suggesting that could happen for thirty days. In that case, KNOM would operate on an extremely limited schedule in order to ration fuel oil for our emergency generators. As you can imagine, we are hoping that all of this planning is completely unnecessary. WHERE THERE’S A WILL: Please consider adding missions like KNOM to your will. For many years, we have promised to place all bequests into a fund that will help sustain the mission through emergencies and provide for major improvements. INSPIRATIONAL SPOT: Each morning of life marks a new beginning. Leave all your dead past to God’s mercy and the future to His Providence and loving care. Concentrate now only on doing His Will and work in the world, just as you can, just for today. INSPIRATIONAL SPOT: There is only one person who can return to God the love that He gives to me. That person is me. 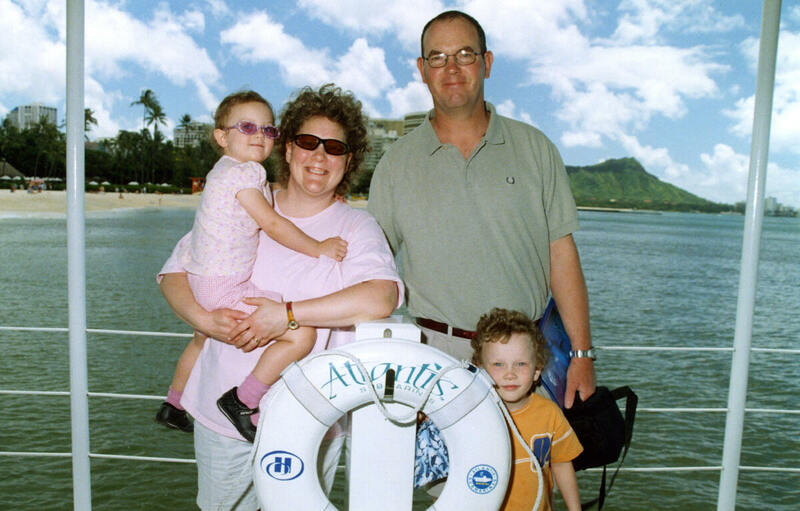 REUNION: (left): For KNOM office assistant Robyn Woyte and children Steven and Gracie, it was a short but joyous Hawaiian get-together with husband John, who is halfway through a one-year term of duty in Iraq. He is a major in the Alaska Army National Guard. If you write KNOM, chances are that Robyn is the person who will open your letter. She’s no stranger to the military. A retired captain in the National Guard, she once piloted Black Hawk helicopters. Please join us in praying for John’s safe return in December. THIRTY YEARS AGO: In June 1976, KNOM’s float in Nome’s Midnight Sun Festival parade took second prize. It featured a huge old style radio. Volunteers Jeanne Gabriel, Florence Francis, Therese “Tweet” Burik and Mary Adams beautified it, while Greg Mitchell and Mark Hoelsken broadcast from it, using a portable transmitter. THIRTY-FIVE YEARS AGO: A series of equipment failures delayed KNOM’s signing on the air for the first time. Engineers Tom Busch, John Pfeifer and Alex Hills scrambled to make everything ship-shape for the station’s inaugural broadcast, now scheduled for the second week of July 1971. INSPECTION: In the third week of May, KNOM had a full “alternative” FCC inspection by engineer Ken Benner, who checked every aspect our operation with a fine tooth comb. We passed with flying colors. Ken called us one of the best radio stations he’s ever seen, and that’s high praise, as he has inspected 8,000 stations over the past eleven years. 17,000: That’s how many inspirational spots, plus 17,000 educational ones, KNOM has broadcast so far this year — thanks to you. INSPIRATIONAL SPOT: Parenting is not an exact science. It’s not our job to mold our children into our own image or into society’s image of success. Our job is to help our children discover who God created them to be. “RUUD” AWAKENING: (left) Nome maintenance expert Marty Ruud repairs the KNOM studio building’s front door, which had been damaged by an apparent break-in attempt. Marty also serviced the furnace, and examined, lubricated, and in some cases rebuilt, every motor and fan in the building. A long time friend of KNOM, Marty is a ham radio operator who, together with Tom Busch and several others, has led testing sessions that have licensed more than a hundred Nome residents. Over the past few years, those tests have been administered during evenings in the KNOM studios. Thanks, Marty, for your help and for your beaming smiles! DINING WITH BIGWIGS: May 19th, general manager Ric Schmidt, financial officer Tom Busch and thirty other broadcasters spent the evening with FCC commissioner Deborah Tate in Anchorage. President of the Alaska Broadcasters Association, Ric moderated the informational session. As past president, Tom gave a brief presentation on the unique nature of rural Alaska. He spoke of permafrost, isolation, the astronomical cost of living, poverty and disease, and how radio is not just entertainment, it’s a life line. SUBJECTIVELY: Vital western Alaska topics treated this past month included the role of television in villages, higher education, travel to Russia and rural banking. About one visiting villager a year goes missing in Nome, and there’s talk of a possible serial killer. Volunteer news reporter Jesse Zink was in the villages of White Mountain and Golovin for the Bering Strait School District's monthly board meeting. The district, which has 15 schools, covers 80,000 square miles, about the size of the State of Kansas. ONCE MORE, thank you so very much for your prayers and continued support, which allow us to air these important issues, along with the Mass, the Rosary, and all of our other inspirational and educational programming. May Our Almighty Father greatly bless you and those you love!